Why Is a Properly Installed & Sized Air Ducting System So Important? When it’s done right, it’s the secret to your comfort! 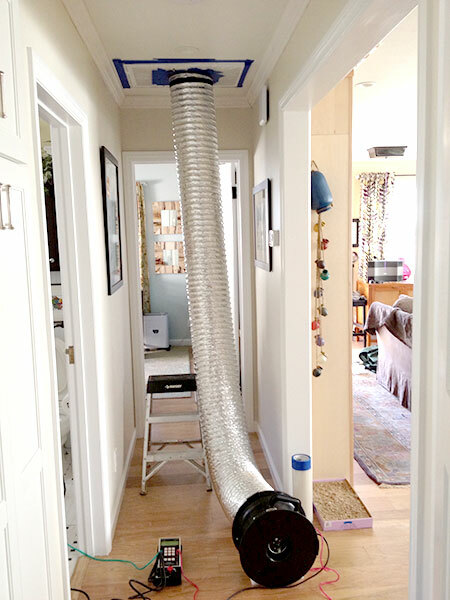 Is your homes leaky air ducting wasting money and making you sick? Repair, seal, or replace old air ducting for better comfort and health. According to the Energy Conservatory, there are more than one million miles of air ducting installed in homes across the United States. Studies indicate that more than two-thirds of them are leaky enough to justify sealing, repair, or complete replacement. Leaking air ducting will significantly increase your central heating and air conditioning bills, introduce potentially harmful indoor air quality problems, unpleasant odors, and significantly lower performance and capacity. 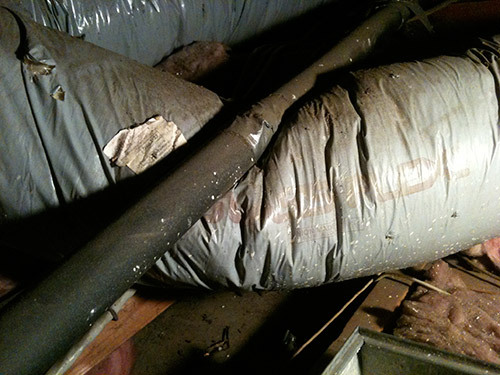 Air ducting leakage is to blame for most of the complaints regarding homeowner comfort. A properly sized air ducting system may be the single most important aspect of a central heating and air conditioning system. When installed correctly, it will maximize the efficiency and capacity of the central heating and air conditioning system by reducing system static pressure and increasing total airflow. Proper airflow and total static pressure has a direct relation on the systems SEER rating. When a system has a high static pressure, the blower motor will work much harder to pull the air into and push the air through the air ducting system, increasing the electrical consumption and reducing the efficiency. When a central heating and air conditioning system has undersized return air openings and air ducting, not only will it increase the static pressure, it will reduce the total amount of air entering the system. This will reduce the total amount of air exiting the supply registers, again, lowering the system capacity and SEER rating. Remember, with respect to airflow, “You can’t give what you don’t get”. At Novell Custom Heating and Air Conditioning Company, we use the Minneapolis Duct Blaster® on all new air ducting installations and repairs. The Duct Blaster® is used to directly pressurize the air ducting system for air leaks; much the same way a plumber pressure tests water pipes for leaks. We use these measurements to diagnose and demonstrate leakage problems, estimate efficiency losses from the leakage, and certify the quality of a new air ducting installation or repair. Our company guarantees not to damage the wall paper or chip the paint on your interior finishes during testing. Most companies use some sort of tape or other plastic sticky film to cover your supply register openings while testing. Many times, these materials will pull off the paint or wall paper from the wall or ceiling, leaving your home with unsightly damage around the registers in some or all the rooms. 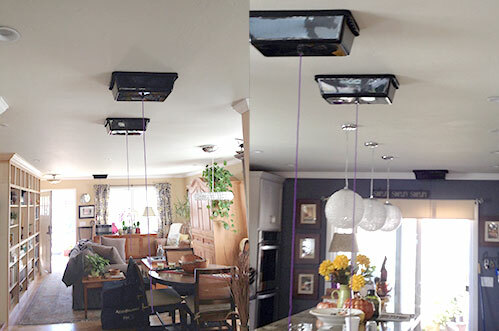 At Novell Custom Heating and Air Conditioning Company, we always use the Vent Cap System™. The Vent Cap System™ is a reusable box with an integrated draw string and soft, non-adhesive foam rubber gasket that attaches to the supply air register creating an airtight seal. There is no risk of damage to your homes interior finish. It also cuts down on our testing time so we will be out of your way much quicker; we know your time is valuable. Our installation team will design and install your new air ducting according to the latest industry standards and to local code requirements using Wrightsoft® load calculation software. Our company uses the best materials available. All air ducting systems are designed using a minimum R-6.0 insulated air ducting and in many cases R-8.0 insulated air ducting, depending on individual customer needs. New air ducting installations are installed with a manual dampening system that will give 100% control of airflow to all rooms. After installation has been completed, we will “test out” our work and verify the job meets California’s energy code for allowable leakage. Studies indicate that in a typical home, approximately 15%-30% of the air that moves through the air ducting is lost due to poor connections, holes, and other common problem leakage areas. The result is higher utility bills and difficulty keeping the house comfortable and dust free, no matter how the thermostat is set. Novell Custom Heating and Air Conditioning Company will make sure all accessible air ducting is repaired and then sealed, using a non-toxic air ducting sealant. After repairs have been completed, we will “test out” our work and verify the job meets California’s energy code for allowable leakage.